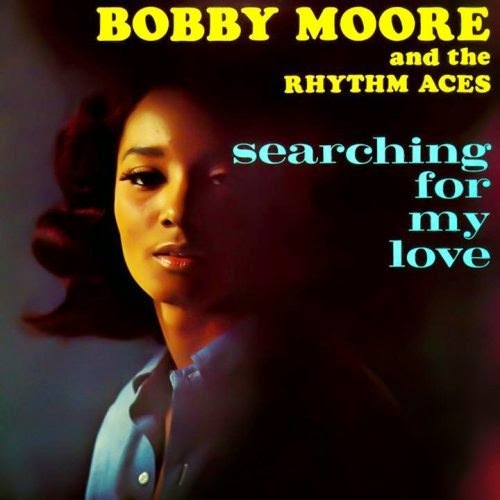 Bobby Moore & The Rhythm Aces is an American R&B band originally formed in the 1960s. Bobby Moore was born in New Orleans in 1930, and joined the US Army in his teens. He formed his first band during the 50s whilst stationed at Fort Benning, Georgia. He was demobbed in 1961, and moved to Montgomery, Alabama, where he put together a new group. The Rhythm Aces were a seven-piece R&B band, consisting of Moore himself (tenor sax), his brother Larry (alto sax), singer Chico Jenkins, guitarist Marion Sledge, keyboardist Clifford Laws, bassist Joe Frank and drummer John Baldwin. They performed locally, and got the chance to support several big name acts including Sam Cooke and Ray Charles. In 1965 they went to record at Rick Hall's Fame Studios in Muscle Shoals, Alabama, producing the brilliant single "Searching For My Love". It was heard by Leonard Chess, who release it on his Checker label, and it charted nationally at #27 pop and #7 R&B. A full album was recorded, but their subsequent singles were not as successful, and by the end of the decade they had been dropped from Checker. Though they only ever had one hit, the Rhythm Aces are apparently still around today, performing as a wedding band throughout the South (though Bobby Moore himself died in 2006). Their one original album still sounds fresh today, full of great catchy R&B tunes, and the title song is a real classic. STUCK IN THE PAST AND NOW STUCK IN THE PRESENT WITH BOBBY MOORE JR. Wonderful stuff! Got two checker 45s in my collection which I've played to death for years. Can't wait to hear the whole LP, and check out the rest of your great site.